Stretching is a highly beneficial practice, and it is of great help in the treatment of pain and other symptoms of sciatica. The sciatic nerve is the longest nerve in the body, that stretched from the spine, through the buttocks, down the legs, to the feet. In most cases, this condition affects only one body side. “It is unique because it is a combination of sensory and motor neurons. This means that aside from sensing through the skin, it helps move your legs as well. “Moving in certain ways can aggravate sciatic pain, but in some cases, it can actually help relieve the pain. Some people find that sitting, standing for a long time and moving around abruptly tend to trigger pain. The types of movements that tend to make pain worse involve scrunching or shortening the spine, such as raising the legs up, bringing the knees toward the chests or squatting. On the other hand, lengthening the spine through stretching, yoga or laying down can help develop good posture while reducing stiffness, inflammation, and pain in a big way. 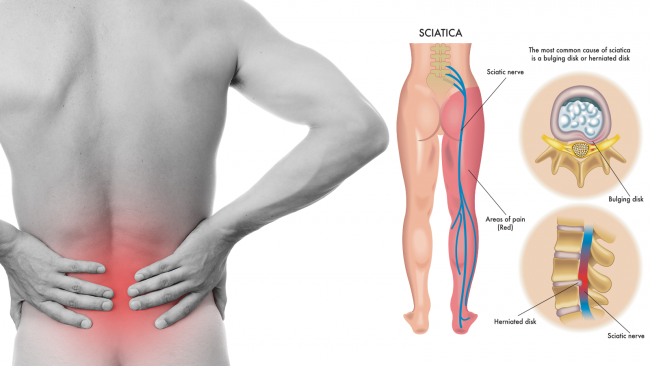 Some of the most important movements for preventing sciatic pain target the back, building strength and relaxing stiff areas. Start in the same position, and bring the legs into a bent-knee position. Next, cross one leg on the opposite knee, grasp the thigh of the leg whose foot is on the floor, and gently pull toward the chest. Hold for 30 seconds, release, and make three repetitions. Start on all fours, and straighten the arms directly below the shoulders. Align the knees with your hips, and push the back upward to create an arch like a cat, and hold for 10 seconds. Then, return to the original position, lower the middle of the back into a reversed arch, with the head up, and hold for 10 more seconds. Make 12 repetitions. Get down on all fours, with your hands out in front on the yoga mat. Stretch the hands forward while lowering the body into a crouch. Get down on all fours, with the hands on the floor as you slowly widen the knees. The inside of the calf and feet should touch the floor. Lower the body down to the forearms, hold for half a minute, and repeat three times. Stand with the feet together in front of a sturdy table. Then, raise one leg and let the heel rest on the table in front of you, while the legs remain straight. Bend forward at the waist with a straight spine, hold for 30 seconds, and release. Repeat three times. Start by lying down on a mat, with the knees bend, and a hard pillow under your head. Then, bring one knee toward the chest, hold it with the hands, and then stretch the leg upward for a count of 30. Return to the initial position, and repeat three times. Ying on the mat with a firm pillow under the head and the hands on both knees bring the knees toward the chest, hold for 30 seconds, and return to the initial position. Repeat three times. Lying on the back with the knees bent and a pillow to support your head, stretch the arms to the sides to create a T shape, and rotate the knees to the left. Hold for a minute and repeat on the other side.